I've really been getting into juicing lately. 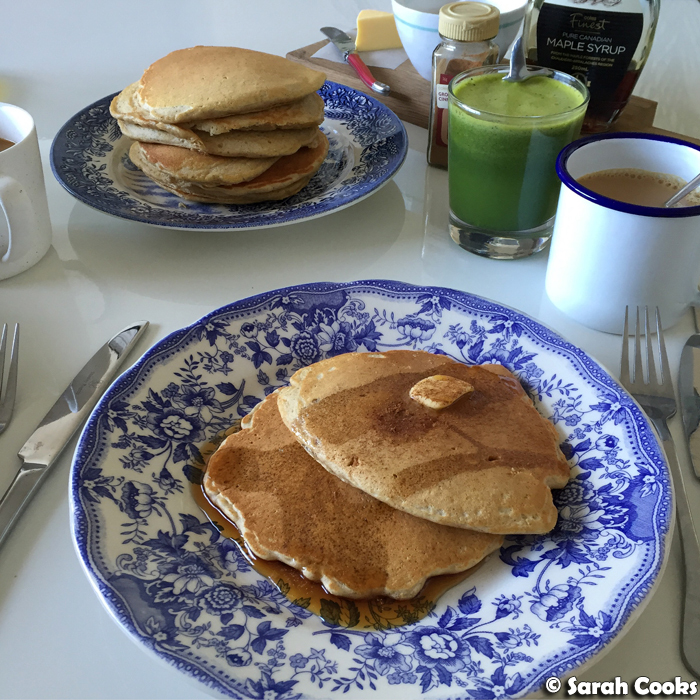 I'm often having a little green juice with my breakfast, and sometimes with dinner too. 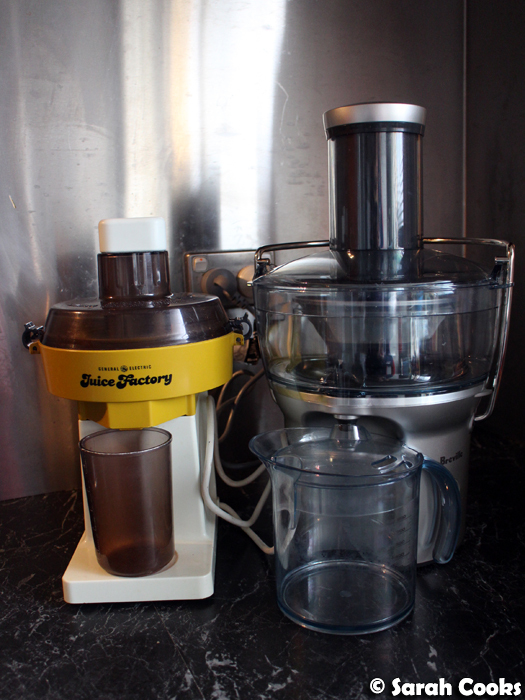 As I mentioned in my most recent Unblogged Files, after having enjoyed a delicious green juice at my friend Clarice's place in Paris, I thought I might try unearthing my parents' old General Electric Juice Factory to see if I could commit to the way of the juice. Turns out that I love juicing! And Sandra loves it even more than me! 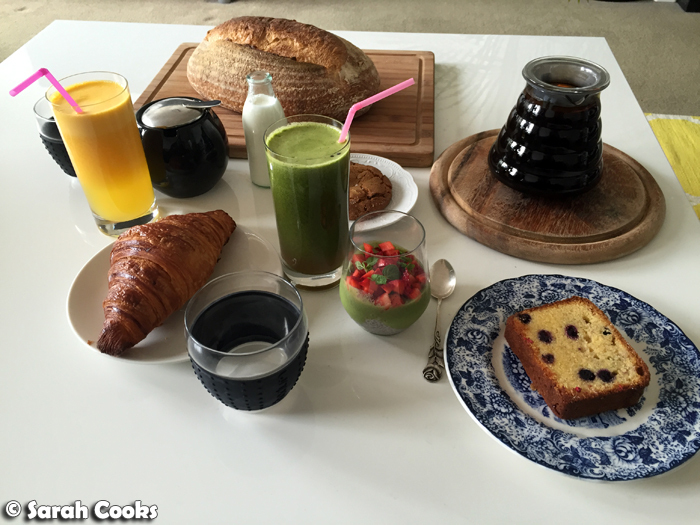 About a fortnight after we borrowed the Juice Factory, she decided to splash out on a brand new Breville Juice Fountain for us. Ta-dah! The old juicer has been returned to my parents, and the new one takes pride of place on the kitchen bench and gets used at least every second day. (For what it's worth, the GE Juice Factory is over 20 years old and still works very effectively). Both machines are centrifugal juicers, and work the same way. You put the fruit or vegetables through the chute at the top, and they get pressed against a rapidly-rotating blade and a micro-mesh filter, extracting the juice and leaving the pulp behind. Some models separate the pulp into a different container for you, making it easier to clean, but they're quite a bit more expensive, and I don't find it too difficult to tip the pulp into the bin and then rinse the parts clean afterwards. I've never been a frequent fruit juice drinker, always being nervous about consuming sugar mindlessly, even if it does come with lots of nutrients. 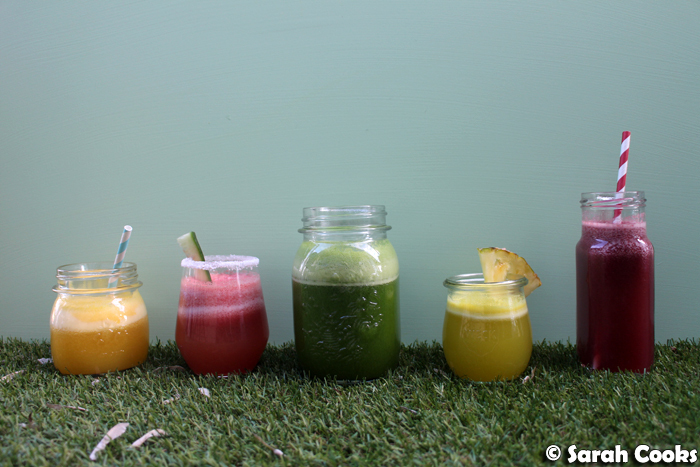 Good quality cold-pressed juices (like my beloved Green Press! ), also tend to be very expensive, so I consider those to be an occasional treat. 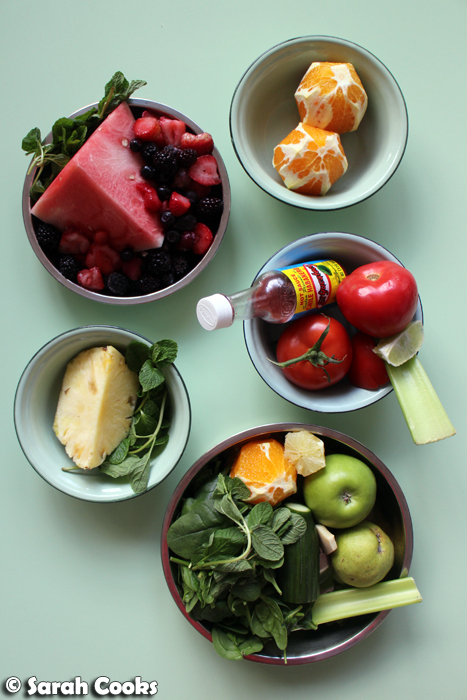 When I make my juices, I try to do a mix of vegetables and fruit, to minimise blood-sugar spikes, and I tend to keep them quite small, usually 250 millilitres or less. 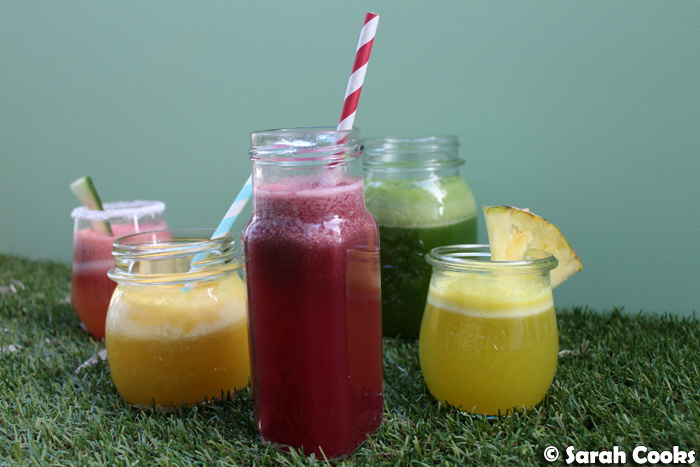 For this blog post, we decided to make a few different juices in a variety of pretty colours. Normally, however, we'll go for a big grocery shop on the weekend (staples include: oranges, apples, cucumber, celery and spinach), and then make various juices throughout the week. Ooh... pretty colours. I also love any excuse to whip out my various jugs, jars and bottles. 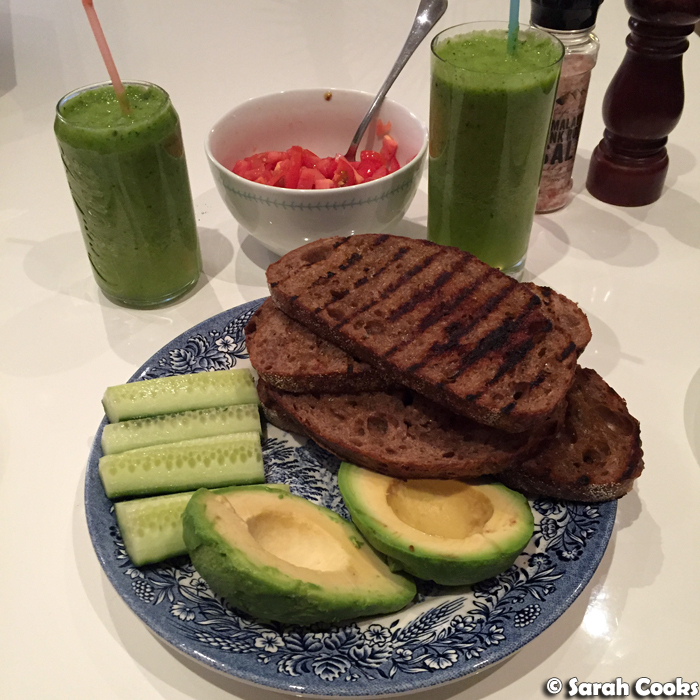 While we're here, I thought I'd show you a few different meals I've made recently with juices on the side. 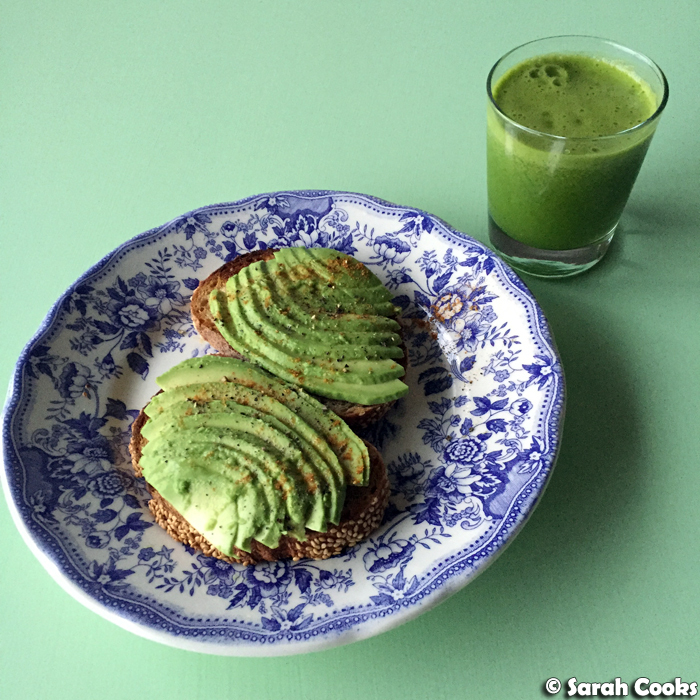 And here's one of my usual avocado toast breakfasts, with some extra green goodness. 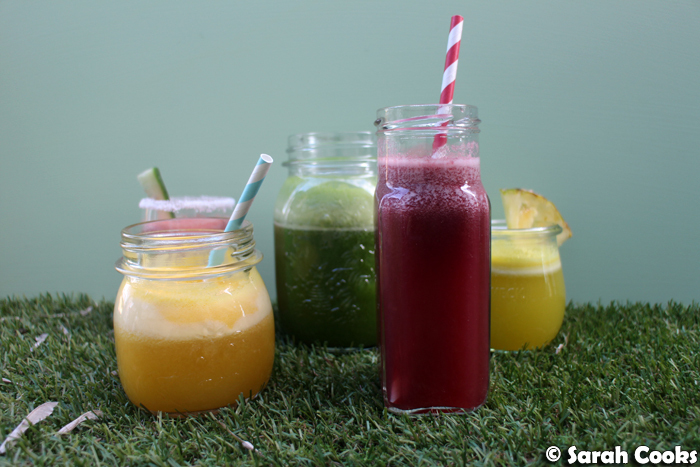 I can't wait for summer - we're planning to use the juicer to make fresh summery cocktails when we have friends over. Can you imagine, rum with juice from a freshly squeezed pineapple? A Screwdriver with proper orange juice? Bloody Marys made from really ripe, summer tomatoes? Hooray! (Also, hit me up with your summer cocktail ideas). For today, however, I'd like to share with you my favourite breakfast juice. It has a good mix of fruit and vegetables - it's not overly sweet, but at the same time it doesn't taste like freshly mown grass. All the green vegetables (spinach, cucumber, celery) make it feel fresh and nutritious, whilst orange and apple provide sweetness. Ginger and lemon bring warmth and sourness, and help me feel better when I'm feeling rundown or worn out. To save time, I normally prep the ingredients the night before, and leave them in a tupperware in the fridge overnight, and then run them through the juicer as I'm preparing breakfast. I hope you enjoy it as much as I do! Wash all the fruit and vegetables. Peel the orange and cut into pieces that will fit your juicer. Core the apple and cut into pieces that will fit your juicer. Cut the rind and pith away from the lemon. 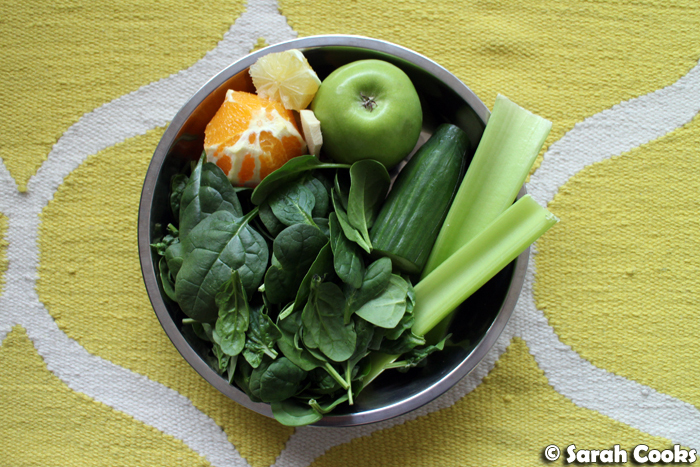 Place all the ingredients through the juicer, starting with the juicier fruits and ending with the celery sticks. (I.e. follow the order in the ingredients list). Do you juice? 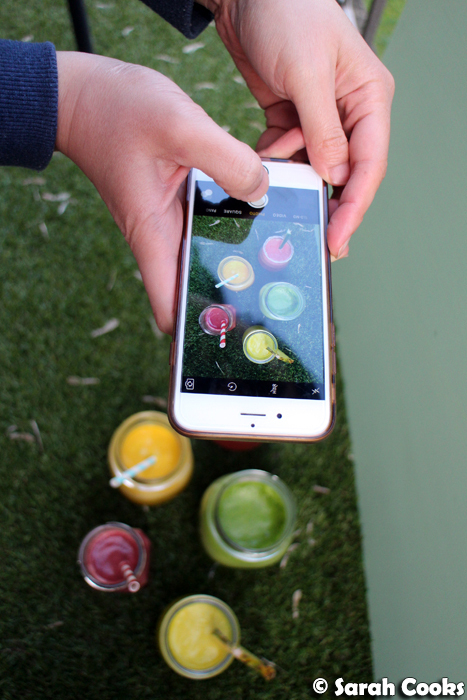 What juicer do you have? What are your favourite flavour combinations? I used to juice quite regularly but have gotten out of the habit. I use the George Foreman Mix & Go. My favourite juice was very like yours but with no celery or orange. I also did a mix of kale and spinach and sometimes I added frozen berries for sweetness. This turned the mix a lovely shade of mud brown! So appetising! I love lemon and ginger in my juices. and is naturalized in the Indian subcontinent.? Really nice and useful post.